High school students, two-year college students, and university students all need to know how to write a well-reasoned, coherent research paper—and for decades Kate Turabian’s Student’s Guide to Writing College Papers has helped them to develop this critical skill. In the new fourth edition of Turabian’s popular guide, the team behind Chicago’s widely respected The Craft of Research has reconceived and renewed this classic for today’s generation. Designed for less advanced writers than Turabian’s Manual of Writers of Research Papers, Theses, and Dissertations, Seventh Edition, Gregory G. Colomb and Joseph M. Williams here introduce students to the art of defining a topic, doing high-quality research with limited resources, and writing an engaging and solid college paper. The Student’s Guide is organized into three sections that lead students through the process of developing and revising a paper. Part 1, "Writing Your Paper," guides students through the research process with discussions of choosing and developing a topic, validating sources, planning arguments, writing drafts, avoiding plagiarism, and presenting evidence in tables and figures. Part 2, "Citing Sources," begins with a succinct introduction to why citation is important and includes sections on the three major styles students might encounter in their work—Chicago, MLA, and APA—all with full coverage of electronic source citation. Part 3, "Style," covers all matters of style important to writers of college papers, from punctuation to spelling to presenting titles, names, and numbers. 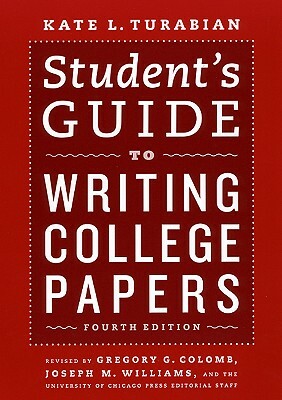 With the authority and clarity long associated with the name Turabian, the fourth edition of Student’s Guide to Writing College Papers is both a solid introduction to the research process and a convenient handbook to the best practices of writing college papers. Classroom tested and filled with relevant examples and tips, this is a reference that students, and their teachers, will turn to again and again. Gregory G. Colomb (1951–2011) was professor of English at the University of Virginia and the author of Designs on Truth: The Poetics of the Augustan Mock-Epic. He is coauthor, with Wayne C. Booth and Joseph M. Williams, of the best-selling guide The Craft of Research, published by the University of Chicago Press.